The "like" is the predominant gesture on social media, whether you're sticking to Facebook or shifting to Instagram. It may even be the most common gesture among humans nowadays. Some of us probably "like" content from our online friends more often than we communicate with them in real life. Depending on the context, a "like" may indicate sympathy, respect, encouragement, acknowledgement or recognition, all of which have a positive or at least neutral connotation. But while it is often immediately clear how a "like" is to be interpreted, at other times it is utterly obscure. This is because many social networks don't give an option for noting that you've registered something but don't actually like it. There is rarely an opportunity to "dislike" or "downvote" a picture, a link or an opinion on many social networks. And there is rarely an opportunity to register some other sentiment in between liking or disliking – let alone the reason or the intention behind the sentiment. In real life we have options. We can say hello to an acquaintance in the street or acknowledge their presence with a lofty nod to make sure they know we've seen them but indicate that we don't want to actually waste our precious time chatting to them. But if a friend posts a status update on Facebook about feeling ill, you have to "like" it to acknowledge it. Some people "like" the update, but that doesn't necessarily mean they are pleased to hear their acquaintance has the flu. A "like" or an upvote may be a simple and efficient way to share content between users. Some social media sites also issue network "like" action graphs, displaying stories of the content that a user has liked on their profile and on the news feeds of friends. This in turn may drive distribution even further across multiple publics even to the point of utter embarrassment for some when social network search engines are based on "like"-registrations. To complicate things further, pages where users gather to celebrate misogynist humour, or an interest group united by their predilection for decapitations have had many "likes" or upvotes. Some are genuinely expressing a perhaps misguided agreement with the content, but not all. Some are saying they agree with the opinions expressed on the page but others are simply acknowledging that someone has created a page with some content they believe should be a public focal point – "like" it or not. Thus "likes" or up-votes may mean many things to different parties, from positive to negative, from approval to disapproval, from sympathy to disgust and the frame, perspective or context only seldom reveal why individuals, as well as groups, have registered their "likes" or up-votes. In everyday life, speech acts are known as utterances and a "like" or upvote is therefore a virtual utterance. One should accordingly distinguish between the locution – the act of performing an utterance; the illocution – the significance of the utterance as a social verbal act; and the perlocution – the effect of the utterance, be it to persuade, to inform, to threaten or inspire. If "likes" are ambiguous because people can only resort to one mechanism to express acknowledgement, the illocutionary and perlocutionary acts become ambiguous as well, even if the illocution is presented as unambiguous by a "thumbs-up" icon. How are other users to react to a "like" – if they react at all? Are the "likes" for a certain post expressions of congeniality or repulsion – who knows? It depends on individual inclination as well as framing. Some people never "like" something for any other reason than genuinely liking it but it's often hard to keep track of who they are. Individual "likes" or upvotes may seem insignificant and their ambiguity may not be harmful on their own but the aggregation of "likes" can make for a very potent public signal that others may take into account when deciding what to believe or do. If the sentiment behind just one "like" is ambiguous, then on aggregate, the public signal that is sent out by a large group of "likes" may become highly disconcerting gestures with a lot of signal noise. It can potentially create more chaos than clarity since it is impossible to separate out all the intentions behind a group of, say, 10,000 "likes". It is a bit like rushing to Grand Central Station, trying to catch the last train to Hoboken from Manhattan. You hear the public announcement begin by stating the train's destination but it gets garbled before you can find out which platform it is leaving from. You start looking around to see what other commuters who might be going to Hoboken are doing. But for all you know, they might be looking to see which platform you are going to. They might have as little idea as you about which way to turn. Since none of you know for sure who is going to Hoboken, the social proof established from aggregated uncertainty is unreliable at best, although you would all like to go to Hoboken. Just as in real life, when humans act together without all the information, confusion can, and often does ensue. We can use this as a lesson in our online life. We can't guarantee that everyone in our network will only "like" things they actually like, but if you think before you "like", at least you'll know what you really mean. 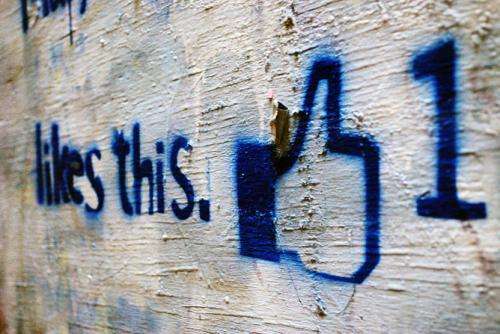 Facebook cracks down on insincere "Likes"
Would you 'like' a chance to 'sympathize' on Facebook?